Watermelon has to be the one fruit that truly epitomizes summer in the USA. When it's ripe, it is sweet and juicy and refreshing. So realizing your watermelon is unripe—or over-ripe—is a big disappointment! You spend all that time cutting the huge melon only to find it is mealy, bland, and dry, or overly sweet and mushy. Watermelons are picked when ripe, but, unfortunately, many watermelons sold in commercial grocery stores are often picked too early or too late. Considering this type of melon doesn't ripen after it is off the vine, the flavor and texture of the fruit will not improve any once it is harvested. One of the best places to buy a watermelon is from your local farmer's market or fruit stand, but if you are purchasing from the supermarket, there are a few things you can look for—and do—to tell if a watermelon is at its peak. 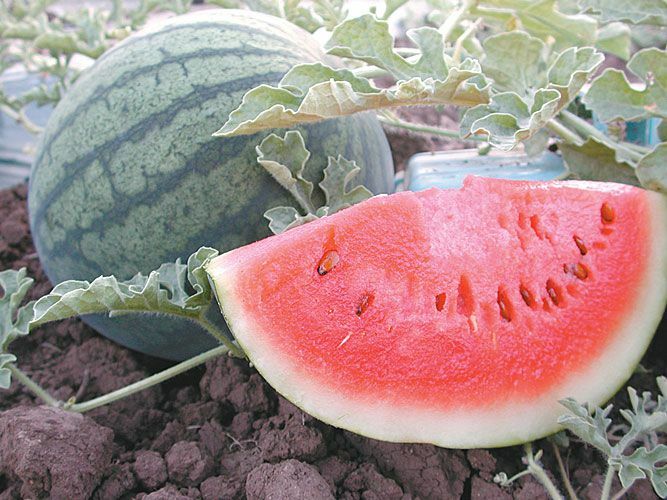 As when buying most fruit and vegetables, you want to choose a watermelon that is blemish-free. Find a melon that is nice looking, meaning void of dents, bruises, and cuts. You also want to turn it over to look at the melon's "belly." If it has a yellow or light bottom (sometimes called "buttery"), it means it should be ripe. If stripes are found all around the melon, move on to the next one; it's just not ready yet. You may see people at the market tapping on watermelon and then putting their ear close to it. What exactly are they listening for? They are checking for signs of hollowness. You want to gently knock on the watermelon, like you are knocking on a door, and listen. (You can also flick the rind with your finger.) If you hear a "plunking" sound, it means it is hollow and therefore ripe. If the sound is more high pitched, then the watermelon is not ripe yet. An over-ripe melon will make a "thud" sound that is a lower pitch. The distinctions may not be simple to detect the first few times but the more you try the easier it will be. Ripe watermelons are heavy. Watermelons are made up of mostly water, so an ideal melon should be heavy for its size. Lift up the melon and then test one or two more, comparing their weights. Choose the heaviest. While you are holding the chosen watermelon, take in its aroma. (Better to do this when it is away from the other melons so there's no cross odor.) You want the fruit to smell slightly sweet like you want it to taste. If the sweetness seems a bit strong it means the melon is over-ripe. Of course, considering the size of a watermelon, squeezing it as you would squeeze a lemon is not necessarily feasible. But you should try to push in the side of the melon to see how much give it has. You don't want it to feel mushy, but you also don't want it to be rock hard. Somewhere in the middle is ideal. What Is Ice Cream and How Is It Made?